Found one file extension association related to Ashampoo Photo Optimizer and 1 file format developed specifically for use with Ashampoo Photo Optimizer. 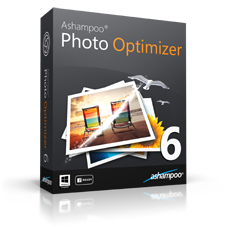 Ashampoo Photo Optimizer revitalizes your photos at the click of a button, effortlessly. The program lets users optimize colors and contrasts for single photos or entire collections with a few clicks. Image sharpness and alignment can be modified just as easily. Minor blemishes can likewise be corrected. Users can whiten teeth, remove red eyes and eliminate skin imperfections. The program also offers various artistic tools for the creative-minded, e.g. image aging effects. Ashampoo Photo Optimizer is made for the average user that seeks to achieve brilliant photos with minimum effort. You can process single photos or entire collections. All features are listed by category and easily selectable through mouse clicks. If you need more information please contact the developers of Ashampoo Photo Optimizer (Ashampoo GmbH & Co. KG), or check out their product website.